Finally a Killa all purpose seasoning!!! Killa seasoning is the fresh new seasoning to use on chicken, steak, pork, fish, veggies, or whatever you eat!! Killa Seasoning is a recipe I came up with through my love of BBQ and good food in general. The recipe is now over 10 years old, having only been bottled for the last few; only because my friends urged me to. I worked in restaurant management for many years and learned a lot of food recipes from some very skilled chefs. I also travelled back and forth to Peru to visit family since the year 2000 and used some of my knowledge of Peruvian and South American foods in my recipe. My recipe combines the taste of American BBQ and the flare of Latin American dishes perfectly. It can be used for cooking or as a condiment on you favorite foods. 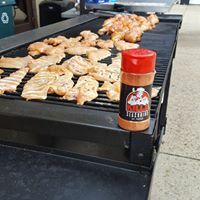 What started as one bottle used at Jets tailgates has turned to having my recipe bottled and used by some high end chefs across the United States, including one dedicated Killa Seasoning user who WON the TV Show / competition Chopped on the Food Network! You can check out his "Craft Burger" food truck here. Thanks for visiting - check back for new flavor combos, photos and videos, as well as upcoming events featuring your #1 fresh new seasoning! Killa Seasoning has earned a place on the table in local eateries around the United States! Will use Killa Seasoning by request on breakfast sandwiches and sells bottles.